Received: November 24, 2017; Revised: February 11, 2018; Accepted: March 29, 2018; Published online: September 1, 2018. To investigate the incidence of venous thromboembolism (VTE) after total knee arthroplasty (TKA) with chemoprophylaxis using acetylsalicylic acid (AA) or rivaroxaban in Korean patients. Between May 2011 and November 2013, 268 TKA patients (330 cases) were randomly allocated to 3 groups (group A: subcutaneous injection of 5,000 IU low-molecular-weight heparin for 2 days followed by oral administration of 100 mg AA for 5 days; group X7: oral administration of 10mg rivaroxaban for 7 days; and group X10: oral administration of 10 mg rivaroxaban for 10 days). Multidetector-row computed tomography (MDCT) was performed at 10 days and 3 months postoperatively to evaluate VTE changes. The VTE incidence was 38.2%, 20.0%, and 10.0% in groups A, X7, and X10, respectively (p<0.001). Pulmonary embolism (PE) was identified in 19.1%, 10.0%, and 2.7% in groups A, X7, and X10, respectively (p<0.001). Proximal or symptomatic deep vein thrombosis (DVT) occurred primarily in group A, but the incidence was not significantly different among groups. On follow-up MDCT, PE was resolved completely with treatment in 29/30 (96.7%), and so was asymptomatic distal DVT in 24/27 (88.8%) without treatment. Rivaroxaban had a lower incidence of overall VTE than AA, but no difference was observed in symptomatic VTE. The 10-day course of rivaroxaban had a lower incidence of overall VTE than the 7-day course. Since total knee arthroplasty (TKA) is considered a high risk factor for venous thromboembolism (VTE), thromboprophylaxis is commonly recommended1). However, the actual incidence of VTE and the need for routine thromboprophylaxis after TKA in Asians are controversial. A recent meta-analysis showed that the incidences of deep vein thrombosis (DVT) and symptomatic pulmonary embolism (PE) were low (40.4% and 0.01%, respectively) in Asians without chemoprophylaxis, despite the westernized life-style and aging of the population2). However, since the incidence of DVT proven by venography is reported to be 50%–76.5% and that of PE proven by lung perfusion scan is 17.1% in cases without prophylaxis, routine thromboprophylaxis should be reconsidered3,4). In contrast to Western studies, which typically describe the incidence of VTE with chemoprophylaxis, most Asian reports have investigated the incidence without chemoprophylaxis. Thus, due to insufficient data, the need for prophylaxis after TKA in Asians remains debatable. Recently, rivaroxaban (factor Xa inhibitor) has shown superior results compared with low-molecular-weight heparin (LMWH)5). However, there has been no report on the VTE incidence after TKA with chemoprophylaxis using rivaroxaban or acetylsalicylic acid (AA) in Asian patients. Traditionally, the VTE prevalence is believed to be lower in Asians than in Caucasians6), and recent reports confirmed this belief2), and shorter prophylactic regimens tend to be favored in Asian patients; however, no supporting evidence has been found thus far. In the present study, we investigated the actual incidence of VTE and hemorrhagic outcome after TKA with currently available chemical thromboprophylaxis in Korean individuals. We also studied whether a shorter prophylactic duration has a similar prophylactic effect compared with the currently recommended duration in Korean patients. The protocol was approved by the Institutional Review Board (HYUH IRB no. 2011-R-37), and all patients provided informed consent. The inclusion criteria for this prospective, randomized and controlled study were patients who underwent primary TKA, including unilateral or staged bilateral TKA with a 2-week interval, between May 2011 and November 2013. A total of 278 patients (341 cases) who met the inclusion criteria were allocated into 3 groups according to the different prophylactic regimens. We assessed the patients for VTE using a 64-channel multidetector-row computed tomography (MDCT) indirect venography system (Brilliance 64; Philips, Eindhoven, The Netherlands) at 10 days postoperatively. The exclusion criteria included renal insufficiency, contrast allergy, simultaneous bilateral TKA, MDCT conducted before 10 days postoperatively due to suspicious VTE symptoms7,8), a previous VTE history and varicose veins. 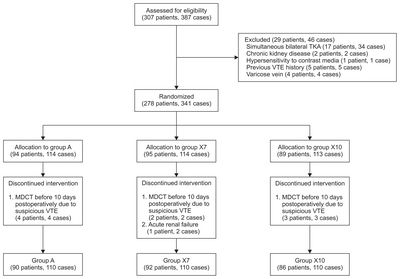 After applying the exclusion criteria, 268 patients were ultimately included in the study with 110 cases allocated in each group according to the computer-generated randomization code (Fig. 1). In the cases of staged bilateral TKA, the same prophylactic regimen was used for the first and second operations. Baseline demographics and clinical characteristics including Charlson comorbidity index were similar among 3 groups (Table 1). Patients were randomly allocated into 3 groups according to the different prophylactic regimens. In group A (90 patients, 110 cases), subcutaneous injection of 5,000 international units (IU) of Fragmin (dalteparin, LMWH; Pfizer, New York, USA) was given daily for 2 postoperative days, which was followed by 5 days of 100 mg aspirin (AA; Bayer, Leverkusen, Germany) therapy. In group X7 (92 patients, 110 cases), a shorter regimen of 10 mg Xarelto (rivaroxaban, factor Xa-inhibitor, Bayer) was given orally for 7 days postoperatively. In group X10 (86 patients, 110 cases), 10 mg Xarelto was given orally for 10 days postoperatively. Prophylaxis was started at 6 hours after the end of surgery. For all patients, intermittent pneumatic compression was applied immediately after surgery and maintained for 7 days. However, a compression stocking was not applied. A continuous passive motion machine was used at 1 day postoperatively. We assessed the occurrence of a VTE event using MDCT at 10 days postoperatively. Six seconds after the signal density level reached 100 hounsfield units (HU), a computed tomography (CT) scan was performed from the costophrenic angle to the lung apex. After the injection of contrast media (Ultravist 370, Iopromide, Bayer) thorough the antecubital vein, indirect venography was performed to obtain contrast-enhanced venous phase images. Based on the literature, the estimated radiation dose received per MDCT scan of this study is approximately 7 mSv for PE scan and 8 mSv for DVT scan9,10). A single radiologist evaluated the CT images in a blinded manner. Symptomatic PE was defined as PE with additional symptoms, such as dyspnea, pleuritic chest pain, cough, hemoptysis, tachypnea, rales, or tachycardia7). Symptomatic DVT was defined as DVT involving discomfort of the calf or thigh, a Homan’s sign, swelling, localized hotness, skin discoloration, tenderness, or prominence of the superficial veins8). If the patient presented with severe symptoms, we performed MDCT before 10 days postoperatively. The VTE cases were divided into PE and DVT, and the latter was further subcategorized into proximal DVT (occurring in the popliteal vein and above) and distal DVT (occurring below the popliteal vein). If a patient had asymptomatic distal DVT, the patient was only observed conservatively without any treatment. We only treated patients with PE, symptomatic DVT, or proximal DVT, and a pulmonologist or a chest surgeon was consulted for the management of these patients with anticoagulants. At 3 months postoperatively, patients who had VTE events underwent follow-up MDCT to evaluate the change in VTE. The bleeding amount was checked by drain removed routinely after 48 hours. Bleeding events were classified as major or minor. Major bleeding comprised intracranial, intraocular, retroperitoneal, intraspinal or pericardial bleeding11). Minor bleeding included any unexpected hematoma (>25 cm2), threatened wound hematoma, nasal, gingival, rectal or vaginal bleeding, macroscopic hematuria, coughing or vomiting blood12). Transfusion volume was compared among groups. Additionally, the transfusion volume of staged bilateral TKA patients was compared to that of unilateral TKA patients in each group. The sample size and power calculation was based on the expected incidence of VTE that was approximately 50%13) in group A, 20%14) in group X7, and 7%12) in group X10. The minimal expected difference in VTE incidence was noted between groups X7 and X10, which was 13%. Statistical significance was set at 5% (p<0.05) with a power of 80%; thus, the minimum sample size for each group was set as 110 cases by the chi-square test, considering a drop-out rate of 10%. Statistical analysis was performed with SPSS ver. 18.0 (SPSS Inc., Chicago, IL, USA). For comparison of the categorical and proportional variables, the Chi-square test was used. If more than 20% of the expected frequencies were less than 5, the Fisher exact test was performed. One-way analysis of variance was used to compare the results of numerical continuous variables. However, for some variables without normal distribution, the Kruskal-Wallis test was used. The incidence of VTE is described in Table 2. Compared to group A, the incidence was significantly lower in groups X7 and X10. The incidence was significantly lower in group X10 than that in group X7 (p=0.038). Group X10 had a significantly lower incidence compared with groups A and X7 in terms of PE and PE plus proximal DVT plus symptomatic DVT. In contrast, no significant differences were observed between groups A and X7 (p=0.056 and p=0.074, respectively). The incidences of proximal DVT and symptomatic DVT were similar among the 3 groups, and symptomatic PE was not observed in any of the groups. All DVT events occurred on the operated side. The results of follow-up MDCT are summarized in Table 3. In the cases of asymptomatic distal DVT only, 24/27 (88.8%) demonstrated complete resolution, whereas the remaining 3 cases showed a reduced amount of thrombosis without symptoms. All the proximal and symptomatic DVT cases resolved completely, except for 4 patients who refused to take follow-up MDCT without suspicious VTE symptoms. In cases of PE, 96.7% showed complete resolution (29/30); only 1 patient, in group X7, did not show resolution of PE, which then progressed to chronic PE. However, complete resolution of this patient’s PE was confirmed by follow-up MDCT after 6 months of anticoagulation therapy. The mean bleeding amount was similar among the 3 groups (692 mL in group A, 705 mL in group X7, and 700 mL in group X10; p=0.889) and there was no observable major or minor bleeding event. The transfusion volume was similar among 3 groups (908 mL in group A, 1,014 mL in group X7, and 1,062 mL in group X10; p=0.072). The transfusion volume of staged bilateral TKA patients (909 mL in group A, 1,011 mL in group X7, and 1,067 mL in group X10) was similar to that of unilateral TKA patients (906 mL in group A, p=0.972; 1,021 mL in group X7, p=0.937; and 1,058 mL in group X10, p=0.920). In addition, in the cases that were excluded from the comparison because the MDCT was performed before 10 days postoperatively, no VTE event was noted. In the present study, we noted that rivaroxaban was more effective in lowering the incidence of VTE than AA and that the 10-day course of rivaroxaban was more effective than the 7-day course. Specifically, compared with AA, the absolute risk reduction for VTE, DVT, and PE with 7-day rivaroxaban was 18.2%, 20% and 9.1%, respectively; the absolute risk reduction for VTE, DVT, and PE with 10-day rivaroxaban was 26.8%, 29.1%, and 16.4%, respectively. Although the 7-day rivaroxaban regimen resulted in reduction in the incidence of VTE and DVT events, there was no significant difference in the PE incidence compared with the AA therapy. However, the 10-day rivaroxaban regimen significantly reduced the incidence of PE as well as VTE and DVT. Furthermore, no cases of proximal or symptomatic DVT were noted following prophylaxis with a 10-day regimen of rivaroxaban. Compared with the 7-day rivaroxaban regimen, the absolute risk reduction for VTE and PE with 10-day rivaroxaban was 10% and 7.3%, respectively. Thus, the 10-day rivaroxaban regimen yielded a significantly superior reduction compared with the 7-day rivaroxaban regimen in the incidence of PE plus proximal DVT plus symptomatic DVT, the three clinically important events. At present, no definite strategy for thromboprophylaxis has been established in view of the American Academy of Orthopaedic Surgeons or the American College of Chest Physicians (ACCP)15,16). In the present study, the prophylactic regimens were determined by considering several factors. First, the average body weight of Korean patients (60 kg in this study) is lower than that of Caucasians (79 kg)17). Second, all patients received concomitant mechanical prophylaxis. Third, Asians have certain genetic factors that are associated with a lower prevalence of thrombi6). Fourth, we considered some evidence that shows a favorable symptomatic VTE incidence without chemoprophylaxis in Asians2). Thus, the prophylactic duration in the present study was set at 10 days, which is the minimal duration recommended by the ACCP16), and the shorter duration of 7 days was set based on the fact that VTE most frequently occurs 5 to 7 days postoperatively18). The recommended rivaroxaban dose, 10 mg12), was the lowest dose available in tablet form. The comparative group received LMWH plus AA instead of no prophylaxis due to the ethical concern of withholding prophylaxis from patients. LMWH was initially used to enhance the prophylactic effect considering the increased VTE risk during the immediate postoperative period based on Virchow’s triad (including venous stasis, endothelial injury, and hypercoagulability) and due to the nature of the procedure and/or the high flexion position during TKA18). Therefore, we used a regimen involving 2 days of LMWH and 5 days of AA, which has shown satisfactory results in terms of the reduction in symptomatic VTE incidence19). This is one of limitations of this study: we used 100 mg due to the easy availability of the tablet form and the lower body mass of Korean patients. The ACCP has recently approved the use of AA as a prophylactic treatment16), and 100 mg of AA has shown favorable effects with regard to reduction in the incidence of symptomatic VTE19). However, in this study, AA did not seem to be effective: the incidences of VTE, PE, proximal DVT, and symptomatic DVT with AA were similar to those of another study without prophylaxis in Korean patients (35.7%, 13.5%, 8.7%, and 3.2%, respectively)20). In terms of asymptomatic distal DVT, 24/27 (88.8%) of the cases with asymptomatic distal DVT showed complete resolution, and the remaining 3 cases showed significant improvements, with no complications. Moreover, patients who did not undergo follow-up MDCT had no suspicious DVT symptoms. Thus, in cases of asymptomatic distal DVT, observation without any specific treatment may be sufficient. The need for thromboprophylaxis after TKA in Asians is still debatable. It is important to note that VTE should be considered as a “preventable disease”. Surgeons should be aware that more than 90% of PEs develop as a result of lower extremity thrombi21), asymptomatic DVT can cause the post-thrombotic syndrome, and PE can cause chronic thromboembolic pulmonary hypertension22). Moreover, surgeons have legal and ethical concerns over what can be considered “preventable”. Although current guidelines focus on symptomatic events23), symptomatic VTE cannot be selectively prevented. The present study had several potential strengths. First, this was the first report of VTE incidence after TKA in Korean patients on the recommended or shorter duration of prophylactic therapy. Second, this study assessed VTE events via MDCT that is considered the best modality for detecting PE and DVT24). However, this study has several limitations. First, the preoperative VTE status could not be monitored. However, chronic VTE can be detected on MDCT performed to evaluate the formation of thrombi25), and no chronic case of VTE was observed. Second, MDCT was performed at 10 days postoperatively; thus, we could not confirm whether VTE occurred afterwards. However, none of the patients showed any symptoms or signs of VTE during follow-up at 4–6 weeks and 3 months postoperatively in the out-patient department. Third, there was concern regarding radiation exposure with MDCT scans; however, the estimated radiation dose did not exceed the diagnostic reference level of radiation26). Fourth, the incidence of VTE was evaluated only among different chemoprophylaxis regimens. However, to determine the need for chemoprophylaxis, the incidence of VTE following mechanical prophylaxis should be evaluated and compared to that following chemoprophylaxis. A well-designed comparative study of chemoprophylaxis and placebo is needed to establish guidelines for the Asian patients with TKA. Lastly, the inclusion of patients with staged bilateral TKA performed within 2 weeks might have affected the outcomes although only patients without VTE by MDCT at the 1st stage TKA were included. Fig. 1. Flow diagram of patients included in the present study. TKA: total knee arthroplasty, VTE: venous thromboembolism, MDCT: multidetector-row computed tomography. Values are presented as mean (range) or number of cases (%). One-way analysis of variance test. DVT: deep vein thrombosis, PE: pulmonary embolism. Geerts, WH, Bergqvist, D, Pineo, GF, Heit, JA, Samama, CM, Lassen, MR, and Colwell, CW (2008). Prevention of venous thromboembolism: American College of Chest Physicians Evidence-Based Clinical Practice Guidelines (8th Edition). Chest. 133, 381S-453S. Lee, WS, Kim, KI, Lee, HJ, Kyung, HS, and Seo, SS (2013). The incidence of pulmonary embolism and deep vein thrombosis after knee arthroplasty in Asians remains low: a meta-analysis. Clin Orthop Relat Res. 471, 1523-32. Piovella, F, Wang, CJ, Lu, H, Lee, K, Lee, LH, Lee, WC, Turpie, AG, Gallus, AS, Planes, A, Passera, R, Rouillon, A, and AIDA investigators (2005). Deep-vein thrombosis rates after major orthopedic surgery in Asia. An epidemiological study based on postoperative screening with centrally adjudicated bilateral venography. J Thromb Haemost. 3, 2664-70. Leizorovicz, A, and SMART Venography Study Steering Committee (2007). Epidemiology of post-operative venous thromboembolism in Asian patients: results of the SMART venography study. Haematologica. 92, 1194-200. Russell, RD, Hotchkiss, WR, Knight, JR, and Huo, MH (2013). The efficacy and safety of rivaroxaban for venous thromboembolism prophylaxis after total hip and total knee arthroplasty. Thrombosis. 2013. White, RH, and Keenan, CR (2009). Effects of race and ethnicity on the incidence of venous thromboembolism. Thromb Res. 123, S11-7. Ryu, JH, Olson, EJ, and Pellikka, PA (1998). Clinical recognition of pulmonary embolism: problem of unrecognized and asymptomatic cases. Mayo Clin Proc. 73, 873-9. Wang, CJ, Wang, JW, Weng, LH, Hsu, CC, and Lo, CF (2003). Outcome of calf deep-vein thrombosis after total knee arthroplasty. J Bone Joint Surg Br. 85, 841-4. Jaffe, TA, Yoshizumi, TT, Toncheva, G, Anderson-Evans, C, Lowry, C, Miller, CM, Nelson, RC, and Ravin, CE (2009). Radiation dose for body CT protocols: variability of scanners at one institution. AJR Am J Roentgenol. 193, 1141-7. Saltybaeva, N, Jafari, ME, Hupfer, M, and Kalender, WA (2014). Estimates of effective dose for CT scans of the lower extremities. Radiology. 273, 153-9. Colwell, CW, Berkowitz, SD, Lieberman, JR, Comp, PC, Ginsberg, JS, Paiement, G, McElhattan, J, Roth, AW, Francis, CW, and EXULT B Study Group (2005). Oral direct thrombin inhibitor ximelagatran compared with warfarin for the prevention of venous thromboembolism after total knee arthroplasty. J Bone Joint Surg Am. 87, 2169-77. Turpie, AG, Lassen, MR, Davidson, BL, Bauer, KA, Gent, M, Kwong, LM, Cushner, FD, Lotke, PA, Berkowitz, SD, Bandel, TJ, Benson, A, Misselwitz, F, Fisher, WD, and RECORD4 Investigators (2009). Rivaroxaban versus enoxaparin for thromboprophylaxis after total knee arthroplasty (RECORD4): a randomised trial. Lancet. 373, 1673-80. Westrich, GH, Haas, SB, Mosca, P, and Peterson, M (2000). Meta-analysis of thromboembolic prophylaxis after total knee arthroplasty. J Bone Joint Surg Br. 82, 795-800. Eriksson, BI, Borris, L, Dahl, OE, Haas, S, Huisman, MV, Kakkar, AK, Misselwitz, F, Kalebo, P, and ODIXa-HIP Study Investigators (2006). Oral, direct Factor Xa inhibition with BAY 59-7939 for the prevention of venous thromboembolism after total hip replacement. J Thromb Haemost. 4, 121-8. Jacobs, JJ, Mont, MA, Bozic, KJ, Della Valle, CJ, Goodman, SB, Lewis, CG, Yates, AC, Boggio, LN, Watters, WC, Turkelson, CM, Wies, JL, Sluka, P, and Hitchcock, K (2012). American Academy of Orthopaedic Surgeons clinical practice guideline on: preventing venous thromboembolic disease in patients undergoing elective hip and knee arthroplasty. J Bone Joint Surg Am. 94, 746-7. Falck-Ytter, Y, Francis, CW, Johanson, NA, Curley, C, Dahl, OE, Schulman, S, Ortel, TL, Pauker, SG, and Colwell, CW (2012). Prevention of VTE in orthopedic surgery patients: Antithrombotic Therapy and Prevention of Thrombosis, 9th ed: American College of Chest Physicians Evidence-Based Clinical Practice Guidelines. Chest. 141, e278S-325S. Turpie, AG, Bauer, KA, Eriksson, BI, Lassen, MR, and PENTATHALON 2000 Study Steering Committee (2002). Postoperative fondaparinux versus postoperative enoxaparin for prevention of venous thromboembolism after elective hip-replacement surgery: a randomised double-blind trial. Lancet. 359, 1721-6. Lieberman, JR, and Hsu, WK (2005). Prevention of venous thromboembolic disease after total hip and knee arthroplasty. J Bone Joint Surg Am. 87, 2097-112. Lee, JK, Chung, KS, Baek, SW, and Choi, CH (2012). The prophylaxis of venous thromboembolism in Korean patients with total knee replacement arthroplasty. J Korean Orthop Assoc. 47, 86-95. Park, KH, Cheon, SH, Lee, JH, and Kyung, HS (2012). Incidence of venous thromboembolism using 64 channel multidetector row computed tomography-indirect venography and anticoagulation therapy after total knee arthroplasty in Korea. Knee Surg Relat Res. 24, 19-24. Byrne, JJ, and O’neil, EE (1952). Fatal pulmonary emboli; a study of 130 autopsy proven fatal emboli. Am J Surg. 83, 47-9. Kahn, SR (2006). The post-thrombotic syndrome: the forgotten morbidity of deep venous thrombosis. J Thromb Thrombolysis. 21, 41-8. Barrack, RL (2012). Current guidelines for total joint VTE prophylaxis: dawn of a new day. J Bone Joint Surg Br. 94, 3-7. Winer-Muram, HT, Rydberg, J, Johnson, MS, Tarver, RD, Williams, MD, Shah, H, Namyslowski, J, Conces, D, Jennings, SG, Ying, J, Trerotola, SO, and Kopecky, KK (2004). Suspected acute pulmonary embolism: evaluation with multi-detector row CT versus digital subtraction pulmonary arteriography. Radiology. 233, 806-15. Park, EA, Lee, W, Lee, MW, Choi, SI, Jae, HJ, Chung, JW, and Park, JH (2007). Chronic-stage deep vein thrombosis of the lower extremities: indirect CT venographic findings. J Comput Assist Tomogr. 31, 649-56. Mettler, FA, Huda, W, Yoshizumi, TT, and Mahesh, M (2008). Effective doses in radiology and diagnostic nuclear medicine: a catalog. Radiology. 248, 254-63.